Professor Pezzullo at Fudan University in Shanghai, China. 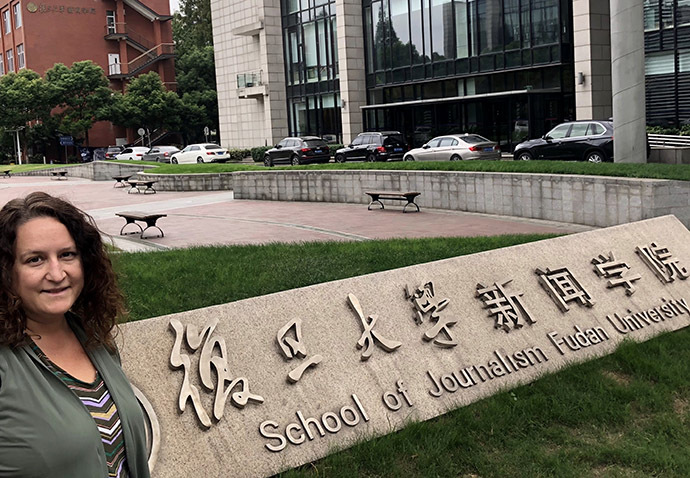 In October, I traveled to Fudan University in Shanghai, China, to co-teach a course in environmental communication. The invitation was extended, in part, because I coauthored a textbook with three-time Sierra Club President and Emeritus Professor Robert Cox, Environmental Communication and the Public Sphere (fifth edition forthcoming). I gave three lectures: Western conceptions of the public sphere; Science and risk communication; and Environmental and climate justice movements. When we address communication and social change, context matters. In the US, democratic rights related to environmental policy are under attack: the right to know has diminished as the current administration has removed data from government websites (for example, the removal of climate data and civil rights information) and there appears to be an endless list of rolled back environmental protections (for example, these 23 regulations removed in the first 100 days). Despite the devastating impacts of neoliberal US policy, most of us hold on to democracy as an ideal driving our engagement in networked public spheres, which shape government decision-making about public goods. Yet, democracy isn’t the only system of governance for environmental action. When I asked students what modes of communication they found to be most successful for publicizing pollution concerns, they offered answers we might hear anywhere: making time lapse videos, sharing compelling images, and connecting stories to people personally. While they appreciated learning about US environmental advocates’ use of projection bombing and time lapse images of coral reefs or glaciers, I valued learning about the cutting-edge features of the tallest green building in the world (based in Shanghai) and ancient concepts such as “jingwei ziran,” signifying a reverence for nature. They appeared reassured that I affirmed the global commitment to climate action, despite the lack of US leadership these days. At COP21 in Paris, my faith in international negotiations for a peaceful solution to climate chaos was rekindled. Although we face uncertainties in the US today and no nation is perfect, cross-cultural opportunities such as this one reaffirm my hope that global environmental progress is possible. I look forward to returning to China in June to speak about the Green Public Sphere and Environmental Communication at the Second Biennial Conference on Communication, Media, and Governance in the Age of Globalization; feel welcome to apply to the CFP.